The Day out of time is the culmination of the 13 Moon Calendar year originated from the Mayan science of time. On July 25th, Sirius (the dog star) rises with the sun. This day is observed as a day free of time in the 13 Moon Calendar. It is a day of reverence and cultural appreciation for the concept 'Time is Art.' This 'free day' is the closing of a 13x28=364 day year. The Day Out of Time re-aligns the 13 Moon calendar to the solar year and re-aligns humanity into renewed appreciation for our inherent divinity and connection to nature. This calendar respects the feminine aspects of nature and integrates them in the reckoning of time. 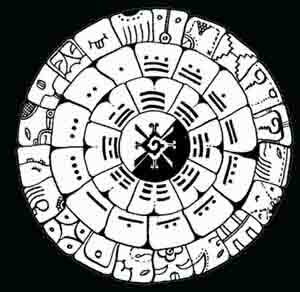 The 13 Moon Calendar also seamlessly functions with the Sacred 260 Day Count of the Maya and other Mesoamerican peoples through the ratio of 13:20. 13x20= 260 Days, which is the average length of a human gestation period. Time is Art. This is a calendar of vision which attunes and aligns us with our environment.